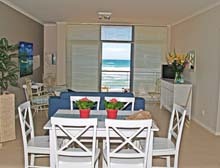 Luxury Apartments positioned on a pristine beach in the prestigious Muizenberg Beach Development. One and two bedroom apartments bathroom(s), a fully equipped kitchen, lounge with a double leather sleeper couch, dining room and a large balcony. Enjoy intimate views of the beach, and beyond that the spectacular False Bay coastlines stretching towards Simon's Town in the west and Gordon's Bay some 50km to the south. Linens Included, Equipped Kitchen, Dishwasher, Stove/Oven, Microwave, Coffemaker, Cooking Utensils Provided, Satellite TV, CD Player, DVD Player,A laundry facility close by. There is underfloor heating and towel rail heaters in some apartmetns. Swimming, Golf, Beachcoming, Fishing, Shopping, Sunbathing, Relaxation,Surfing is a major attraction at Muizenberg Beach, and it is great for family vacations.